This is the first release of Carlos Michelini from the Changos Septet, Pablo Ablanedo Nonet, the Macanudos & Fernando Isella, Santiago Greco Group, Steve Evans Group with which it appears in different Festivales de Jazz and Clubs, in the cities of New York, Boston, Norh Carolina, Chicago. All compositions by Carlos Michelini, except #6 and #13 by Cuchi Leguizamón. Recorded in Boston, USA, May, 2003. "World class reedist Carlos Michelini delivers broad view different styles (Latin, Argentinean, and American) combined into his own ideas. This result is a very urban yet ethnically rich recording. A formidable player with fresh ideas his music reflects influences from smooth to free jazz as he plays with fullness and empathy. His band is also excellent and includes notable young performers pianist Leonardo Genovese, guitarist Julio Santillan, and the ever tight rhythm section of bassist Santiago Greco and drummer Franco Pina . There are many surprises that include voice sampling, socially/politically charged messages, and complex orchestration on many pieces which proves Michelini has much to say." - By Mark F. Turner, All About Jazz, January 2005. "Fresh Sound Records has really been living up to its name lately by releasing some delightfully original, beautifully conceived recordings. 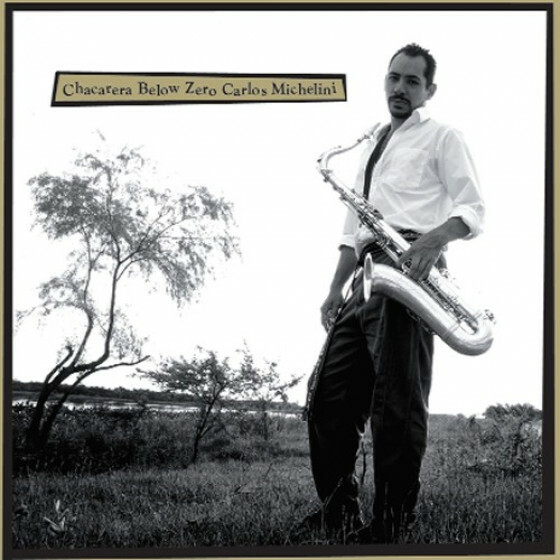 One of the latest is saxophonist Carlos Michelinis Chacarera Below Zero. Born in Argentina in 1972, Michelini began studying piano at the age of eight, before moving on to clarinet and then saxophone a couple of years later. His tutelage under some of the best music teachers in Argentina and Brazil prepared him for a scholarship to Bostons Berklee School Of Music, where he graduated with honors, earning a Bachelors Degree in Saxophone Performance. Michelini has also studied with some of the most accomplished masters of the saxophone here in America, including Jerry Bergonzi, Joe Lovano and George Garzone, among others. His thorough understanding and control of the instrument are definitely apparent on this recording. He plays with a full, robust tone and his solos are an endless stream of exciting, novel ideas. One of the things that contributes to the fresh sound of this recording is the fact that most of the tracks (all but two being Michelini compositions) are based on the folk music of the indigenous people of South America. Carnavalito De La Esperanza has its origins in the rhythms of the music of the Coyas, the native people of North Argentina. El Lauchin originates from the music of the African people that border Argentina and Uruguay. Estacion Piazzola was inspired by Astor Piazzola, his counterpoint melody and the contemporary harmonies used in tango. Some of the songs are vehicles for political commentary. Argentina Expire 03 is dedicated to all Argentinean people who have suffered at the hand of political corruption following the military regime, while Desaparecidos is dedicated to the thousands of Argentines who disappeared and were tortured under this same cruel dictatorship. Also adding interest to the recording is Michelinis use of sounds not usually associated with straight-ahead jazz spoken word, chanting and even some sound effects. El Lauchin, which was written in celebration of his newborn daughter, Vitoria, opens with the sound of a baby crying, and Rain Of Peace begins with the sound of rain falling gently in the background. Nostalgia From Nowhere begins with commentary from Argentinean comedian and satirist Enrique Pinti while Si Llega A Ser Tucumana opens with the incantation-like singing of female folkloric vocalist La Bagualera, followed by lyrics spoken by the tunes composer, Cuchi Leguizamon Zamba. You might think that some of these elements would result in a somewhat gimmicky or pretentious sound, but nothing could be further from the truth. From the first note to the last this recording sounds wholly spiritual and organic, but never overly heavy, even on the more melancholy tunes. This is very emotional music, evoking feelings of joy as well as sadness, but without ever sounding contrived or manipulative. Of course, Michelini would not have been able to accomplish any of this without a great band behind him and fantastic musicianship from all involved. Here, Michelini plays tenor and soprano sax, bass clarinet, b-flat clarinet and some ethnic wind instruments native to South America (the xicus, erque and quenas). Joining him are Julio Santillan on guitar, Leonarado Genovese on piano, Santiago Greco on electric bass and Franco Pina on drums. Everyone delivers a brilliant performance. Chacarera Below Zero is a beautiful blend of modern jazz and world music that shouldnt be missed. I highly recommend it."